Hiring a freelance designer can be a daunting and risky process. There are a lot of fears about staying in budget and meeting deadlines and making sure the work is quality. And these are all questions you can cover with your designer before signing with them, to make sure you’re both on the same page. 1. Do I have a realistic budget and timeline for what I’m asking? If you’re asking for the moon on a platter by tomorrow, that’s going to be more than $50. For example, I once had someone contact me looking for an Amazon-style e-commerce site (which I don’t do… see question 4). Huge site, lots of work. Their budget? $150. I may have spat out my tea. It wasn’t a typo. They legit thought that was a reasonable budget for an insane amount of work. So before you go contacting potential designers, do a 2-part check: one with your common sense, and one with Google to get a rough idea of common rates in your area. Just be sure you’re looking at rates from designers whose quality and experience you want, not just the people charging pennies on sites like Fiverr. You get what you pay for. 2. Do I know what problem I’m trying to solve or alleviate with this project? Design work is not just about making things pretty. Good design also helps solve a problem. Does your visual branding match up with what your business does and offers? Is your brochure cramped and unclear? Is your website not actually helping pull in leads? These and any number of other problems could be the spur that’s driving you to get some professional design work done. When design work has a clear goal in mind, it’s much more likely to be successful (and look good while doing it). So take a few minutes to ask yourself why you need this design work and what you hope to gain or solve from it. Get as specific as you can, and a good designer will help clarify the issue further. 3. Am I prepared to separate what style I personally want from what style is right for my business? I’ve written about this distinction before (here, and here, and here). It bears repeating. To get the most out of any designer-client relationship you need to evaluate a) how much you can separate your personal preferences from what’s right for your business and b) whether you’re really looking for expert help or just want someone to do what you say. Two guesses on which type of approach is more successful. Take a minute to check in with your ego and make sure it’s not in the driver’s seat (and your designer should do the same). 4. Does the designer I’m reaching out to actually do the type of work I’m looking for? This seems like it should be such a simple point, but even a decade in to being an independent designer I’m still astounded by how many people haven’t taken 2 minutes of their time to see if I actually offer what they’re looking for. A quick look at any designer’s portfolio can give you a good idea of the type of work they do and want more of. You’ll notice my portfolio doesn’t have animation, or ecommerce sites, or mobile app mockups, or infographics, or many other things. If the designer you’re considering to build an app interface doesn’t have any sort of mobile work in their portfolio, that’s a big sign they’re probably not a good fit. The small caveat to this is if it’s something similar but not exactly what the designer has shown in their work. For example, I have wine labels and whiskey labels in my portfolio, but (as of yet) no beer label designs. But that’s so similar to other pieces I’m showing, it’s a safe bet that it still falls into the kind of work I would welcome. 5. How do our communication styles and personalities match up? If you prefer phone calls to email, and daily check-ins to only being contacted when there’s something for you to look at or answer, that can make a big difference in how smoothly your designer-client relationship goes (for the record, I prefer the latter in both cases). Also important is whether you’re on the same page regarding sense of humor and level of formality. Some people don’t get sarcasm, and some people do. Some people like a lot of personal small talk and some don’t. If your potential designer is dropping lots of f-bombs in their blog posts and writing, and you can’t stand cussing, that’s going to be a problem. Take a breath to evaluate their online presence and any interactions with them to see if you mesh well. If not, even if they are a super talented designer, it might be best to look elsewhere. Or be prepared to adjust your own communication style if you’re determined to work with this particular person. If you take the time to get clear on these 5 questions, I guarantee your future relations with designers will improve immensely. And if you remove the design-specific terms, these questions are useful for hiring any type of freelancer. It’s always good to make sure you have your own stuff in order before bringing in an outside party. 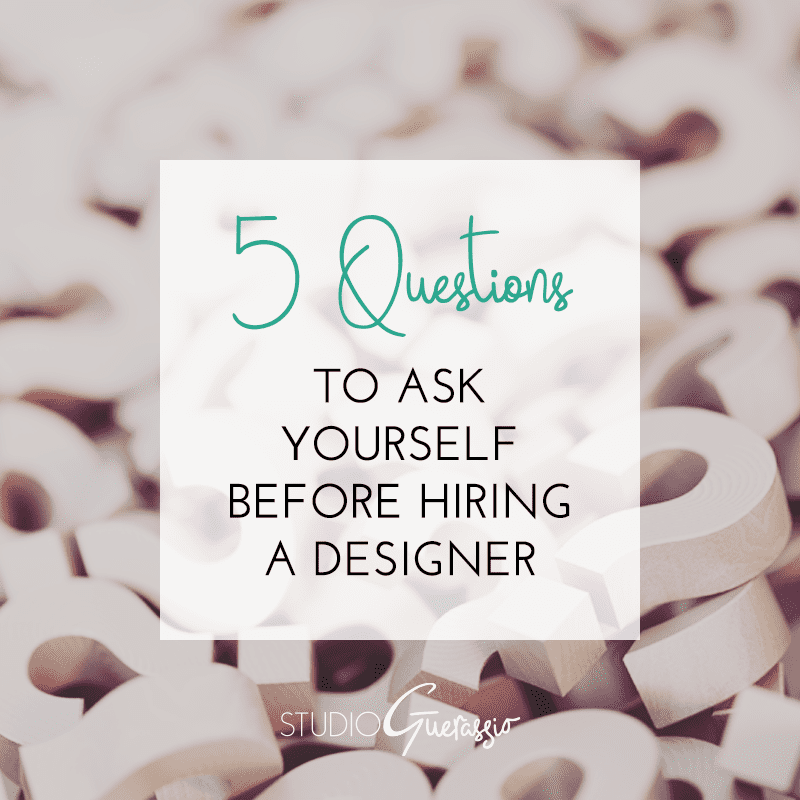 Have you asked yourself these or other questions before hiring a designer or other freelancer?